First things first. When I say “beat the algorithm” I don’t mean use illegal tactics that go against Instagram’s terms and conditions. I mean how do you, as a genuine user, get the algorithm on your side to grow your account organically? Let’s get back to basics for a moment. Before Facebook brought Instagram, the platform would show you posts from people you followed. Simply because if you followed them, it must be because you wanted to see their content. But with the huge expansion and popularity of the platform, it’s not possible to show all posts of everyone you follow all the time. Let’s say on Facebook, you are friends with your two cousins. One male cousin loves motorbikes, but you have never been on a motorbike let alone wanted one, and your female cousin shares your love of cats. Based on your search history, who you follow & what you react to on social media, Facebook will probably show you more posts from your cat-loving female cousin than the motorbike fan of the family. This is the same with IG – the posts you see are based on your previous internet history, not who you follow, necessarily. Which is why, as a business, you need to be super clear about who you are, what you do and who your target market is. So that not only are your potential clients going to understand, but the Instagram algorithm will know what you are up to too. If you haven’t already checked out my blog post on how to craft the perfect Instagram profile, check it out here. This is the first part to understanding the Instagram algorithm. But how do you beat it? Use all of Instagram’s features. Instagram (and other social media platforms) make their money through businesses advertising. Other than the actual entity of advertising on Instagram, there’s no real benefit of advertising on the platform – for example when your campaign ends, the algorithm isn’t going to give you extra points just because you advertised at one point. Use between 11 and 30 relevant hashtags that show Instagram what you are posting about and who it should show your content to. Don’t worry about using 30 hashtags each time, it’s not spammy. But what is spammy is using the SAME 30 hashtags for each and every post. Posting video instead of photos in your feed. I know it feels like you have less engagement with them as it doesn’t show the number of people liking the post, but videos are far more engaging than photos, and that goes for all social media platforms. Some times a simple 360 degree shot of a product, or a timelapse of something going on is the simplest and most effective form of videos for your feed. It’s the end of February, and we haven’t had any algorithm changes yet in 2019. It’s still the same; keep people on the platform by producing engaging and relevant content. So are you ready to beat the Instagram algorithm? Or are you feeling like you have so much more to learn about the online business space? Check out the social media bootcamp here where you will learn the 5 core fundamentals of running your online business. Lead magnets, or freebies, are undoubtedly the single biggest way to engage your potential clients in your business. They create intrigue – you can give away a small amount of your knowledge for free in exchange for an email address. Once you have provided them with that information, you are then gaining the ever important know, like and trust factor before they buy from you. A lead magnet is a piece of information that your potential clients want that you can give away for free in return for their email address. The idea is that once you receive their email address, they can be nurtured by your emails and a percentage of these people will convert to any number of your products or services. Easily created on Canva if you are not good at design work, you can create a pdf sheet to download which comes in the form of a guide, training, how to, checklist or cheat sheet. For example, my lead magnet is a PDF guide – 5 easy ways to improve your hashtag strategy on Instagram. 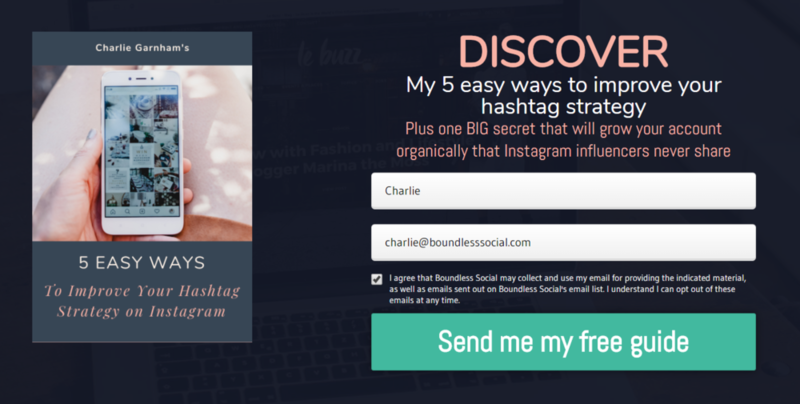 My potential clients struggle to increase their Instagram engagement and understand how hashtags work, so I have created a free guide to enable them to understand hashtags better and do the research to enable their accounts to grow. This is a really good tool for engaging – if you call the quiz a question that your potential clients really want to know about themselves, their business or how they are getting on with everything, then this can really drive a lot of traffic to your sales funnel. Check out Try Interactive to get an understanding of the types of quizzes you can create – you can edit any of their templates or start from scratch. Imagine if you are a life coach and you created a quiz about finding out what type of anxiety do you have, then you can direct people to different pieces of content after collecting their emails. At the end of the content, you can offer them a free 20 min coaching session. Just like the guide from point 1, if you know that your potential clients are struggling with something, you can create a free video training on that subject. But don’t give too much away as you will want to keep some of your best kept secrets for your paid-for offer. If you don’t know how to create a webinar to increase your sales, check out this free high converting webinar script here. For example, let’s say you are a Facebook Advertising guru, you could do a 40 min free webinar on how to start Facebook Ads, but lead them to an offer for your paid for course at the end. An eBook is more a story than a guide, so you can use this if you are looking to create a connection between people who want to become just like you. Lots of digital nomads use this to help people in 9 to 5 jobs understand how to quit their jobs, travel the world and work online. If you are an author, you can provide a sample of your latest book so that people can read it to see if they want to buy. Of course, this can happen on Amazon too, but if you have an e-reader version of your book, or the physical copy to buy, you can charge the same as Amazon does for your book but sell through your website so that you aren’t paying your commission. Challenges are a very good way of driving engagement in your business and creating that all important know, like and trust factor. Usually challenges take place in a Facebook group, so the lead magnet is all about getting people to join your group to take place with the challenge. At the end of the challenge (usually 5 days, Monday to Friday), you will have a) improved something for your members, whatever the challenge may be and b) increased your email list size and c) be in a position to sell people your next upgrade. This one is for those of you who have a product to sell but can be used for service-based businesses too. You can offer a voucher or coupon code for % off your products, or save $10 when you spend $40. That way, you can gain their email address and put them on your newsletter list for future offers, product launches or just general emails, so it’s a great list builder, plus you benefit from that extra sale. You can even make the client feel really good by telling that they are one of only 100 to receive the coupon or something similar. Your opt-in page is the most important part of the lead magnet. Although you have spent a lot of time deciding how to solve your potential client’s problems and creating a beautiful freebie for them, the way in which you sell the offer is more important, otherwise you won’t get many emails on your list. The biggest point that I can make is don’t get Google Slapped! What’s this? Where your offer and marketing are so explicit in what your freebie is, that people just open another tab and Google what you are offering and find the info for free. You need to create intrigue and show your USP (Unique Selling Point) to help your clients understand why they should opt for your freebie. The best opt-in pages are the simple ones! I recommend that you get the Funnel Hackers Cookbook here. Here are some brilliant examples of optins that have made me put my email address in. What is an Instagram Engagement Pod? There are many legitimate ways to grow your account on Instagram, and hopefully we all know by now that engagement is a much better factor to work on than followers. This post will take you through IG engagement pods; what they are, are they legitimate and whether you should use them. What is an engagement pod? Essentially, a pod is a group of people, sometimes in the same broad niche, who support each other with engagement on each other’s accounts. You can have many types of engagement pods; some focus on likes & comments and others are about increasing your following. The rules of each pod differ so you just have to read the pod rules when you join one. Generally, the way the pod will work is that the admin of the group says that they will do a thread at a certain time, and at that time, a thread appears in the group with its rules. So you link your latest IG picture into the thread –which is the first (and easy) part! Now there’s the arduous task of reciprocating the engagement. So your next 20 mins, depending on how many people join the thread, will be spent liking all the other photos that have been linked. So at the end, you have given 100 likes and gained 100 likes (or comments, whatever the thread is for). From what I can see in these types of pods that I have been part of, the admins are very hot on the case and ask you, as the user, to be too. That means no one wants to be called out for not reciprocating and make every effort to reciprocate (and not link drop and run). *NB this type of pod works really well for IG’s algorithm if you time one of your posts to come out just before the thread starts, because IG will see it’s an engaging post and show it to more users. Sometimes, engagement pods can be link dumps; you drop your link to the post you want engagement on in the thread at any time. Depending on the rules, you will have to reciprocate the last 24 hours worth of posts, which means the people who link drop in the following 24 hours will have to like your post. The downside with these pods are that you may have to reciprocate 10 posts but only get 5 likes back, and the admins might not be checking to see if everyone is playing fairly. The last type of groups I have come across are literal link dumps. You post your link in the group at any time you want, and people follow you, comment to say they have followed you, and you have to follow back. The admins are definitely not checking up on anyone here, and most groups like this aren’t niche-specific so you could get 3 followers overall, but none in your niche. Who probably unfollow you 3 days later. Seems silly to have a Facebook group that creates Instagram engagement, but Facebook does provide a really good tool for this type of activity. The better groups to go for are ones that drop threads at specific times, everyone comments on those threads and you reciprocate. More information below on how to search and find Instagram Engagement Pods on Facebook. Telegram, if you haven’t heard of it, is a messaging tool like WhatsApp. If you get invited to a telegram pod, you will have to download the app on your phone and you will be put into a group with others. Just like with Facebook Messenger, you can have multiple people in a group on the messaging system of Instagram. This is the least popular way of creating engagement groups because of the limited functionality of the message system. So everything you’ve read so far sounds pretty good, right? Although time-sensitive pods can be very good to show IG your latest post has some great engagement, the concept of engagement pods is a little frowned upon by IG. However, it’s not something they can easily detect to penalise you for, especially if you use Telegram. It’s hard to find a good engagement pod that works for you. In an ideal world, it would be great to have a pod that is full of people posting in your niche – but there aren’t many niche-specific pods out there. A quick search on Facebook reveals there’s pods for travellers, fitness gurus and photographers, but I haven’t found a pod for pilates instructors, cat trinket sellers or jewellers yet! Some engagement pods are invite only, meaning you won’t even be able to find them online. Start asking some of the smaller influencers in your niche, or perhaps some of the more active people in your favourite Facebook groups to see if they know of any pods or use them themselves. Depending on how good the pod is, the reciprocation might be poor. As mentioned earlier, you might get less likes back than you gave out, or if people aren’t motivated to use the pod, you will find that it’ll be just you and 3 other people sharing likes with each other all the time. My advice when you try a pod is to try it for a week, and if it’s not getting growth in engagement for you, politely leave and move onto the next. How do you find engagement pods? Start by searching on Facebook. Type in your niche name, followed by the search term “Instagram engagement pod” and switch the results to “groups”. If you can’t find anything for your niche, try something similar, and see if you can find a group with more than 200 members and less than 2000 in it. Read the “about” page which should have the rules in it, and see if the pod resonates with what you want. Some can be country specific too, which really helps in this situation so that you know people are in your time zone and you don’t get confused with the time of the threads. If you know enough people in your niche, you can create your own, and find others to join you! So there you have it – the ins and outs of Instagram engagement pods. Now it’s up to you to decide whether to find a couple to use, or whether it’s not really for you. If you want to learn more about Instagram and how you can build your engagement legitimately, join my Facebook group: Instagram Myths Debunked by Charlie Garnham.